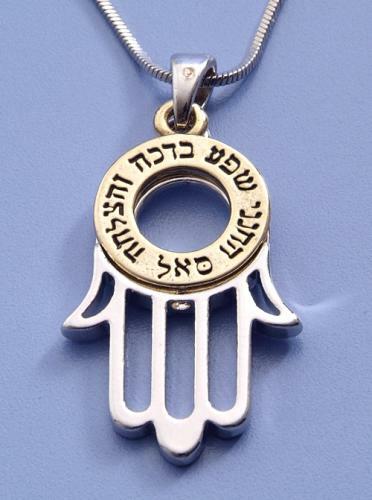 Kabbalah Hamsa Hand Necklace With Wealth Blessing - A Kabbalah Hamsa Hand Necklace with a wealth blessing on it. The blessing is the the "Sa'al" blessing in Hebrew and it's direct translation of it is "Forgive Prosperity Blessing and Success". Kabbalah Red String - It is believed that the one who wears the Kabbalah Red String Hamsa or hangs it in his house, is protected against the evil eye and his life will flourish with success and prosperity, Peace at home, good luck, positive energy, happiness and health. Red is the color of love and blood, so it is associated with energy, strength, power, determination as well as passion and desire. Due to these associations it is the most powerful color for protection against the evil eye. 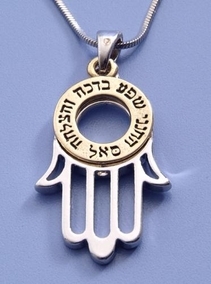 The word "Hamsa" comes from the root word for the number five in Hebrew. The number five is considered to have special magical power bring good luck. In Kabbalah five is the number of the Hebrew letter for god's name. It's symbolizes the creators protective hand. Kabbalah teaches how the universe works spiritually and by applying it, you'll have tremendous advantages in your life. It can help you influence your surroundings through its power, so you can have the things you want. The Kabbalah red string has become extremely popular by celebrity believers Such as Demi Moore, Liz Taylor and of course, Madonna, who completely re-awoken The public interest in the subject of the Kabbalah. The bracelet arrives with an original blessing so you will know this is not just another bracelet that matches your outfit. It has the power to bring beautiful energies into your life!